Today’s Preventive Therapy tip is inspired by my “love” of high heeled footwear. In case you haven’t experienced my spiel about how terrible high heels are for your physical health, here is the Cliffs Notes version: Walking with heels cause the ankle to plantarflex downward creating excessive stress forces at the foot & ankle which causes compensatory muscle movements at the knee, hip, pelvis, and spine. Excessive stress forces are ALWAYS bad for the body and can cause long term changes to your body - bad changes. As a result, I’ve treated patients with foot pain, calf pain, headaches, back pain, neck pain, shoulder pain, and even jaw pain due to chronic use of high heeled footwear. Not to just seemingly pick on women’s footwear; ANY footwear with a raised heel can cause this problem when chronically worn - cowboy boots are culprits too! Both of these stretches MUST include turning the foot and pointing the toes of the foot behind inward toward your opposite heel. 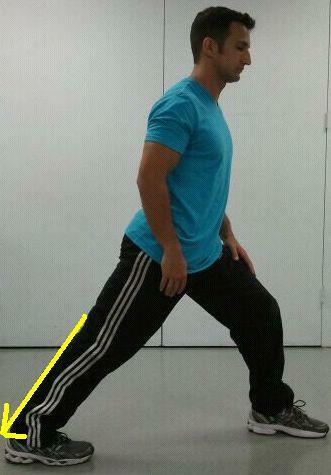 Without turning your foot inward, you will not experience an effective stretch. Also, do your best to keep your heel on the ground during this stretch. Both of these stretches will affect the calf of the foot behind your body. 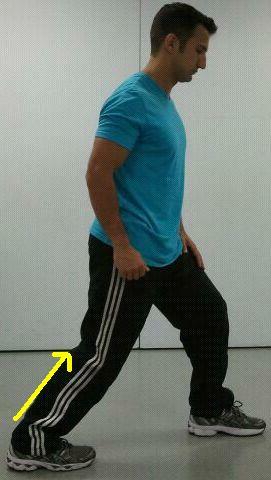 These two stretches can relieve ankle/foot/calf pains due to changed mechanics secondary to footwear. These stretches will also prevent any adaptive changes which may make your body at higher risk of injury. Try doing these stretches before lunch, after dinner, and before you go to bed. Also, I'm sure you've noticed a new model in our images. Please welcome and support Mr. Mike Rein, MS, BS - Exercise Physiologist, Exercise Specialist. Mr. Rein has been developing a blog called "Kettlebell Dynamics" - please take a look and support him! Would these be better done barefoot? That athletic shoe looks like it has a pretty good heel itself. I do prefer my patients/clients to do these stretches when barefoot. However, a generally neutral shoes will suffice. It's true: some athletic shoes do have a more generous heel than ideal, however, these are no where as exaggerated as the inches of heels you see in other models of footwear. Great information! The post is being very informative, i would surely try this at home to cure some pain in my legs.